Bring the wilds of Africa into your room. 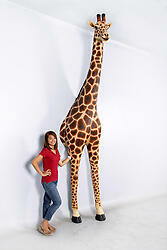 This 12 foot African giraffe wall d?cor offers a wealth of decoration possibilities. This magnificent 12 foot African giraffe wall sculpture extends 4 feet from the wall giving the life size effect without taking up the life size space making this item realistically practical and efficient. 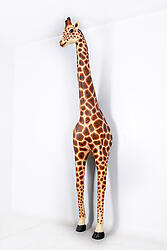 Even though the Giraffe wall sculpture is made from durable cast resin, this item captures the giraffe?s natural beauty with its intricate, hand-painted finish making it ideal for kid?s rooms, classrooms, and African safari theme decor for restaurants, events, businesses and so on.